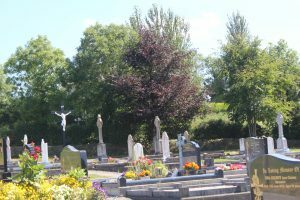 All burials within Crosserlough Parish take place in Crosserlough, Kill and Drumkilly. There is no cemetery adjacent to Kilnaleck Church. There are two cemeteries in close proximity to St Mary’s Church. 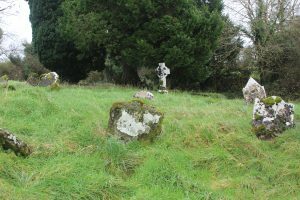 The ‘old cemetery’ is situated in the townland of Crosserlough. It emerged around St Bartholomew’s medieval church. The majority of the gravestones in this cemetery date from the eighteenth century. 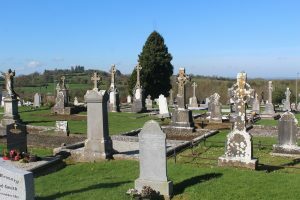 Mary Sullivan’s publication on ‘The Graveyards of County Cavan’ (1998) provides us with information on the recording of inscriptions in the cemetery. The inscriptions were initially recorded by Philip O’Connell and published in the ‘Breifne Antiquarian Society Journal’ in 1929/30. They were also recorded by Crosserlough Macra na Tuaithe Club in 1976 and once more by a team from the Genealogical Centre (Cavan) in 1995. There are some variations in the three recordings, most likely due to the fact that many inscriptions recorded by O’Connell had disappeared by 1976 and even more had done so by 1995. 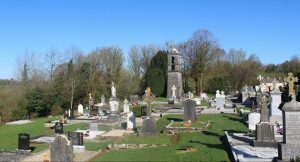 The ‘new cemetery’ is in the townland of Cullow, adjacent to St Mary’s Church. It is the largest cemetery in the parish. 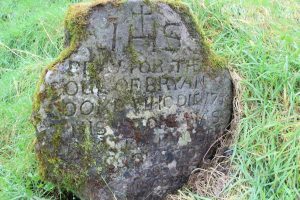 The oldest headstones in the ‘new cemetery’ can be found opposite Latnadrona Road and Cullow House. A church once stood in the centre of this part of the ‘new cemetery’. It had a distinctive T-shaped design, as illustrated on the Griffith Land Valuation Maps of the mid-1850s. Griffith Land Valuations Maps can be viewed at www.askaboutireland.ie.The church was destroyed by fire in 1880. During the 1930s the cemetery was extended into an area of ground between the former and current primary schools, with the first burial taking place in these plots in 1936. 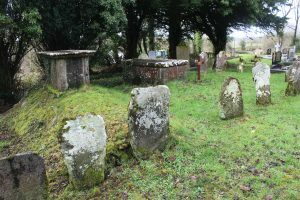 There is no cemetery in the village of Kilnaleck. 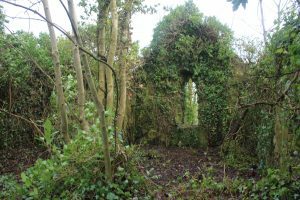 Kill cemetery, located in the townland of Kill, has been the burial ground of many local families for generations. It is also a graveyard with historical significance, with burials going back to the seventeenth century. 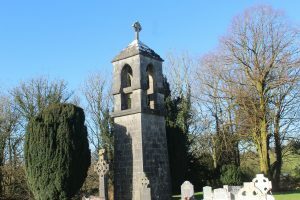 The mausoleums of the O’Reilly’s of Baltrasna (Oldcastle) are in this graveyard, as are the burial tombs of Colonel John O’Reilly (elected Knight of the Shire for County Cavan in 1689) who died in 1717 and Dr Hugh Edmund O’Reilly, former Vicar General of Kilmore. Philip O’Connell, in his 1927 writings, described the tombstone of Dr O’Reilly. He made the point that the massive horizontal slab was dated 1688 and was deeply sunk in clay. He described a series of emblems and symbols engraved on the slab. Myles Reilly, grandson of Colonel John O’Reilly, is buried in his grandfather’s mausoleum. Fr Terence Smith was parish priest in 1704. The resting place of Fr Smith is believed to be in Kill cemetery. Clay from his reputed burial place is considered ‘blessed’. Locals and visitors alike often bring clay from the plot in the hope of relieving ailments and /or curing illnesses. 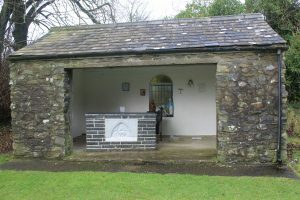 O’Connell’s writings also refer to the tomb of the Wilton family. The tomb is located inside the ruins of Kill Church. At one time the Wilton family possessed a vast amount of property in the locality. Mass is celebrated in Kill graveyard on Cemetery Sunday every year. 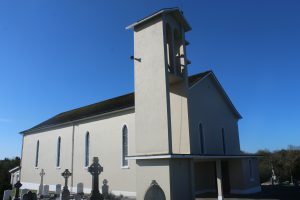 St Joseph’s Church has two cemeteries and both are situated in the townland of Drumkilly. The ‘old cemetery’ surrounds St Joseph’s Church and the earliest recorded burial date in this graveyard is 1863. The headstone relating to this burial can be found close to the porch on the southern side of the church. 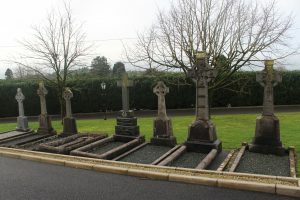 The ‘new cemetery’ is located behind Drumkilly Hall, between the church and the parochial house, and adjacent to the old school house. The first burial took place in the cemetery in July 1941. Fr Alexander McCabe is buried in this cemetery. A Drumkilly native, he was the last serving Rector of the Irish College in Salamanca (Spain), before it closed in 1951. His father, James McCabe, was principal of Drumkilly National School from 1886 until 1927. The McCabe family resided in the school house.